"Winter" across the much warmer south. being a tourist along the way. be heading away from the Falls into Lake Erie. 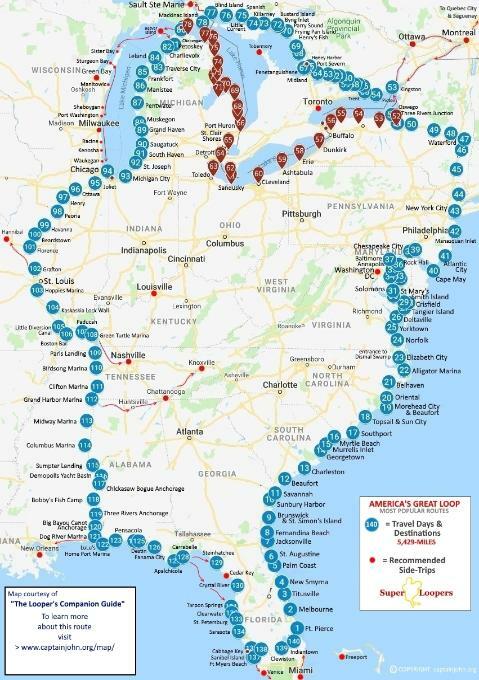 Your first of the three Great Lakes you will be cruising on this totally American side route. Loopers make Kingston their Port of Entry into Canada. Either route you take (Canada or Great Lakes) both will separate at 3-Rivers junction and meet up again at Mackinac Island at the top of Michigan. world of stuff to see and do and you have plenty of time of time to do it. As you only need 27-travel days to reach Mackinac Island. will instantly know how many "travel days" you need to reach your any of the best destinations on the entire Great Loop. more interesting destinations along the way. You will also need days not cruising simply to rest. Count on it! routes will end up requiring the same number of travel days. other destinations as highlights of this voyage. defined and where quaint little places with savory seafood will beckon your return. Our suggestion? Don't miss cruising Canada! that 19' 1" bridge you must go under. "Great U-turn". This leg of your journey takes you to the Mississippi River at Grafton, IL. fuel range) you may want to continue south on the Lower Mississippi route to New Orleans. "Land between the Lakes", and the very "Heartland of America". your gateway for a side-trip to Nashville. This is a beautiful cruise and we have lots more about it on this link. 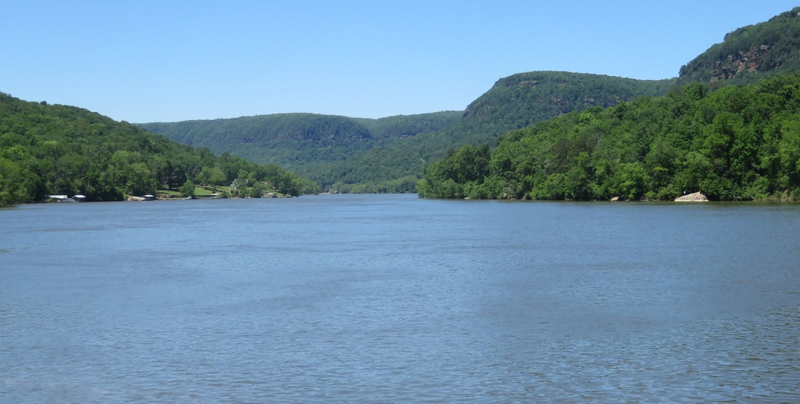 miles further is the entrance of the Tennessee-Tombigbee Waterway. way) was a bigger man made canal project than the Panama Canal. WOW! and does get awful chilly at times, those times are few and short lived. course are the little off the route detours we make along the way. It just doesn't get any safer, easier, or better than this! 5,429-miles, 140-travel days, averaging 40-miles a day. You can do this! How's this for Great Loop Map? "Looper Speed" (near 8-mph) it will take you to get there? Just count the travel days on the map. 140-travel days to cruise it. certainly a journey, and by definition, a voyage, it is so much more than a boat ride, words fail miserably at describing it. translates most closely into English as: "must see, must experience". For sure, this is a must see, must experience for anyone that dreams of safe travel & adventure. Amazon's current price. 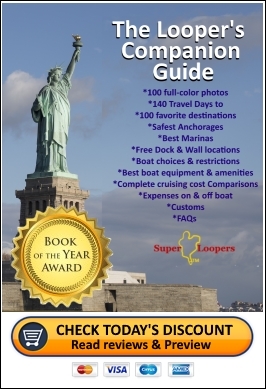 Don't forget, when you purchase the "The Looper's Companion Guide"
on Amazon.com, it also comes with a FREE Kindle version from Amazon. you close to shore, it is the very longest route to Tarpon Springs. and visit some of the more incredible sites. The voyage from Roland Martin's Marina to Indiantown is an easy day's run. From Indiantown, it is 51-miles to Ft. Pierce Marina. This is where we "cross our wake". completed safely & comfortably on a very affordable budget. anchored or docked in a marina every evening before dark. have made this voyage before you.